What Freddie Steinmark (Finn Wittrock) wants most in the world is to play football. 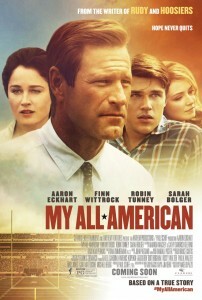 Deemed too small by the usual athletic standards, his father trains him hard, and Freddie brings a fight to the game that ultimately gets him noticed — by none other than legendary University of Texas coach Darrell Royal (Aaron Eckhart). Awarded a scholarship and a chance to play for the Longhorns, Freddie sets off to Austin with his loving high school sweetheart Linda (Sarah Bolger), determined to make the team. Alongside his old teammate Bobby Mitchell (Rett Terrell) and new pal James Street (Juston Street), Freddie is put through the paces of a grueling practice schedule, but the boys’ camaraderie off the field translates into solid playing on it, and they rise up the depth charts, giving the Longhorns a real chance to turn the team around. But just when they’re reveling in the success of the season, Freddie suffers an injury that leads to a shocking diagnosis and the biggest challenge he will ever face. 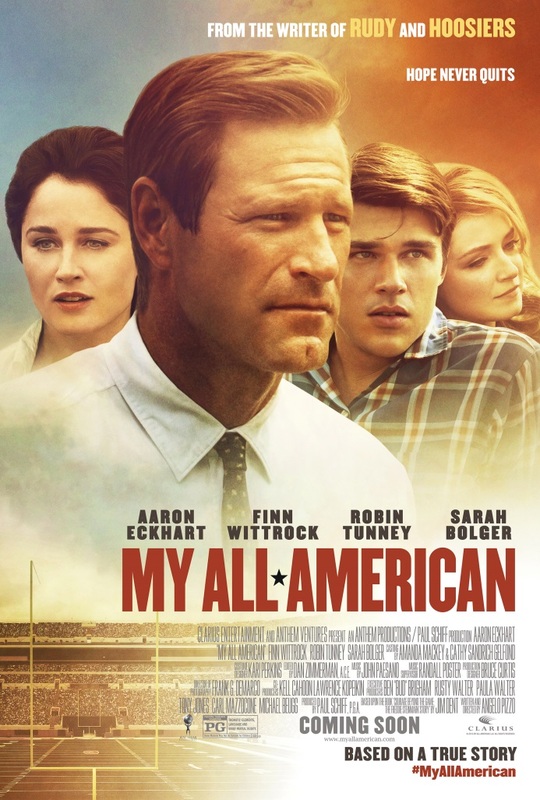 From the writer of HOOSIERS and RUDY, MY ALL AMERICAN tells the true story of a boy who became a hero and what it truly means to have the heart of a champion.